Poor flowering of your crapemyrtle could be related to a heavy infestation of powdery mildew. Or it could be related to both powdery mildew and one of the landscape conditions that favors powdery mildew – too much shade. The most common symptom is a white powdery growth on the leaves, which may also be noticed on the shoots, flowers, and fruit. 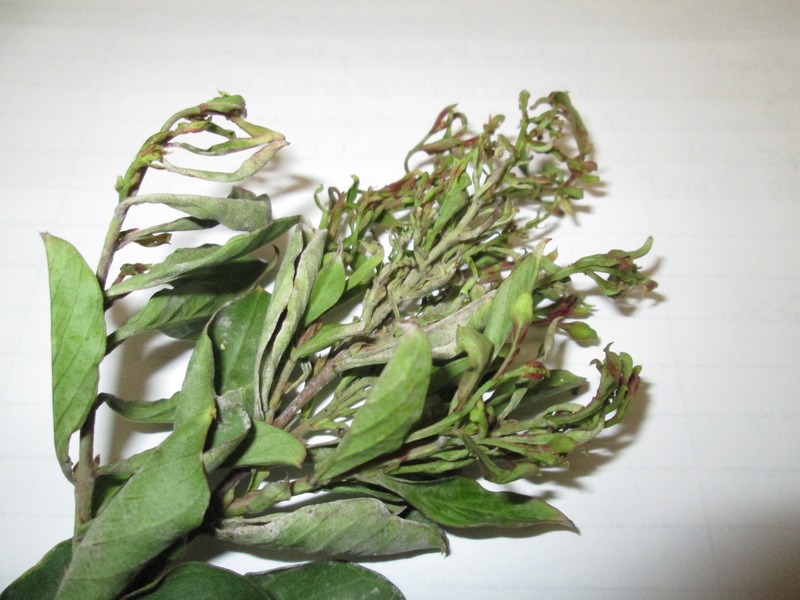 The disease may also cause stunting, distortion, and discoloration of the terminal growth, as seen on the crapemyrtle sample pictured below. Stunting and distortion of the terminal growth of a crapemyrtle infected with powdery mildew. One of the unique characteristics of powdery mildew is that, unlike most fungi, it does not require moisture on plant surfaces in order to infect and reproduce. However, the disease is favored by shady and humid conditions. This is why crapemyrtles planted in shady locations with limited air movement will be more likely to flower poorly, and to be infected with powdery mildew. Fungicides are available for powdery mildew management, but other strategies should be considered first. Avoid highly susceptible plant species or cultivars (such as the crapemyrtle cultivars ‘Gray’s Red’, ‘Orbin’s Adkins’, ‘Carolina Beauty’, ‘Wonderful White’, ‘Raspberry Sundae’ and ‘Potomac’). Locate potentially susceptible plants in sunny locations with plenty of air circulation, and prune surrounding vegetation as needed in order to maintain these conditions. Avoid excessive fertilization or irrigation, which will stimulate new growth that will be highly susceptible to infection. • What Is the Proper Way to Prune Crapemyrtles? • Crapemyrtle Twigs on the Ground?